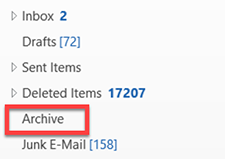 Nearly all new copies of Outlook these days (those on Windows desktop, Mac, Outlook.com, Outlook smartphone app, and Outlook on the Web) have the ability to use the Archive Button. If yours has that button, you should consider using it. It’s an excellent single-folder filing tool. To find it, look on your Home tab next to the Delete button. Note that it’s only available in the latest Outlook versions (e.g. later releases of 2016) and with newer Exchange Server or Outlook.com servers. So if updating your copy Outlook doesn’t make it appear, sorry you are out of luck. It’s a great tool because it’s so easy to use. With any mail selected in your Inbox, just click the button (or tap the Backspace key on your keyboard), and the mail gets moved to (an automatically created) Archive folder. You can use it just like I recommend you use the Processed Mail folder, and it can replace that folder in my MYN system. The Archive button is also present at the top of each fully opened mail message, so you can file right from an open message, which is convenient. It acts a lot like the Archive button in Gmail in that it simply moves the mail to a different part of your server. So like Gmail it’s not true archiving because it does not free up space on your server. But many of us these days have plenty of server space and can go years without cleaning the server. Lesson 1.4 in the new Outlook Inbox Ninja video course teaches you details of using the Archive button to speed up your mail processing, and many other lessons in that course show you how to integrate its use. And section 7 of that course shows you how to do true archiving in case your server does in fact fill up eventually. So consider giving the Archive button a try. Due to volume of work, I recently gave up my very detailed mail folder structure and now just “archive” everything to the single folder and rely on search. I agree with Mike. I like things to be organized, so I used to have a lot of folders and sub-folders, but now I just put everything in one folder. Me three. With improved search and unlimited mailbox sizes there simply is no reason to use subfolders (except for automatically filtering out noise using preset rules). Outlook is the most popular software for using the email client. you can use the outlook archive button for filter the record by date wise. you can also use Thunderbird Email for the better result. I agree to those who want to put all the mails in one folder. I used to have a lot of sub-folders also. I’m just not sure what the benefit of archive is compare to “Processed Mail”. Aren’t they essentially the same thing? Thanks Michael. That makes sense.